The Bellamy Salute, the national salute of the U.S. until 1942’s Flag Code was adopted. Looks like those kids are defecting to Germany and joining the Hitler Youth, doesn’t it? Well, in fact, those are (probably) faithful American citizens performing the Bellamy Salute. The Bellamy Salute, now infamous for being the Nazi regime’s favorite way to say “Hello!”, was the national salute of the United States before being replaced by the Pledge of Allegiance in 1942’s Flag Code laws. 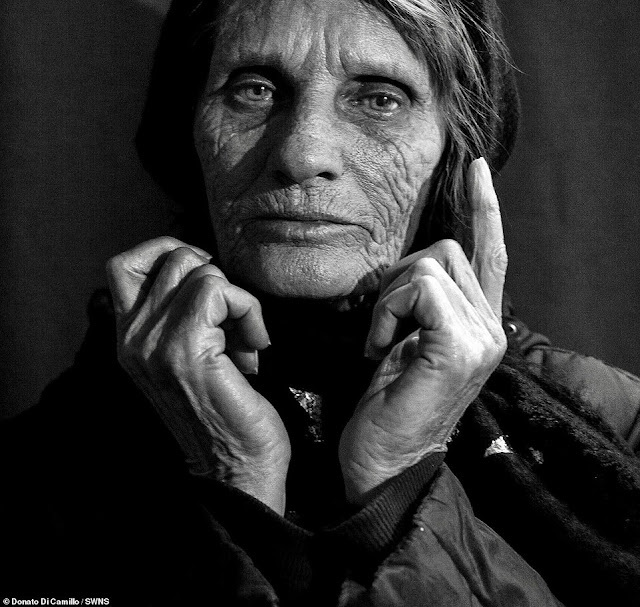 For those of you keeping score, that’s three years after the start of World War II. Seventy one years ago -- December 22, 1942 -- Congress got the United States out of what had turned into an unexpectedly embarrassing situation. It concerned the Pledge of Allegiance -- specifically, something called the Bellamy Salute. Most people today have likely never heard of it, but the Bellamy Salute was once a constant part of the country's life. Daniel Sharp Ford, the owner of a magazine called Youth's Companion, was on a crusade to put American flags in every school in the country. He sensed that the U.S. needed a boost of patriotism. Keep in mind: Not even 30 years before, the Civil War had still been raging. National unity was a fragile concept. It didn't take long for the Pledge to become wildly popular, even omnipresent. At schools, at campgrounds, at public gatherings, in Congress, people routinely faced the flag and pledged their allegiance to it. Instructions for carrying out the salute were printed in the pages of Youth's Companion. The gesture came to be called the Bellamy Salute, in honor of the Pledge's author. The Bellamy Salute consisted of each person -- man, woman or child -- extending his or her right arm straight forward, angling slightly upward, fingers pointing directly ahead. With their right arms aiming stiffly toward the flag, they recited: "I pledge allegiance..."
For a while, the salute wasn't especially controversial. In the United States there was a growing feeling of discomfort that, when people within the nation's own borders pledged their right-arms-extended allegiance to the flag, they might be construed as inadvertently showing solidarity with the fascist regimes across the ocean. Richard J. Ellis, in his book "To the Flag: The Unlikely History of the Pledge of Allegiance," wrote that "the similarities in the salute had begun to attract comment as early as the mid-1930s." Newsreels and still photos were regularly depicting rallies in Europe's dictatorships, with thousands of people showing their fealty by extending straight-armed salutes. 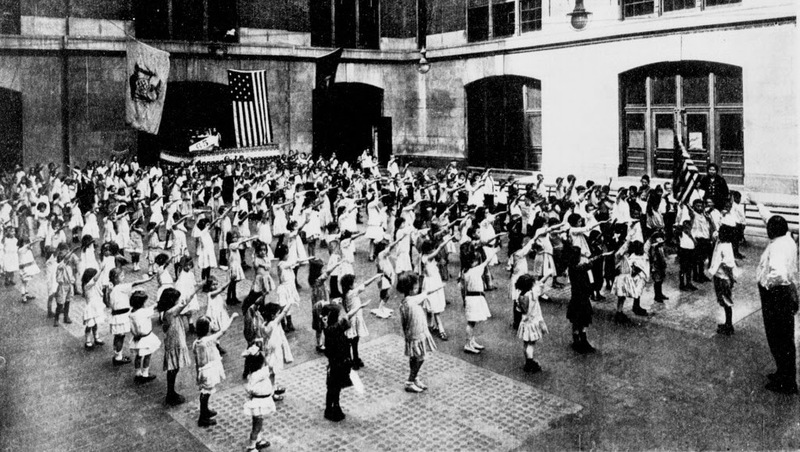 In the United States, the general unease about it -- "the embarrassing resemblance between the 'Heil Hitler' salute and the salute that accompanied the Pledge of Allegiance," in Richard Ellis's words -- was combined with the fear that scenes of Americans offering the Bellamy Salute could be used for propaganda purposes. It wouldn't be terribly difficult to crop the American flag out of photos of U.S. citizens reciting the Pledge of Allegiance; without the flag in the shots, the photos could be mischaracterized as proof that Americans were expressing support for the ideologies of Hitler and Mussolini. Thus, on December 22, 1942, Congress, just before its Christmas break, took care of it. On that day, the amended Flag Code was passed, Section 7 of which decreed that the Pledge of Allegiance should "be rendered by standing with the right hand over the heart." The exact wording of the Pledge has changed several times since Francis Bellamy wrote it; each change was reflective of contemporaneous concerns about the meaning. For example: "I pledge allegiance to the flag" was originally "I pledge allegiance to my flag." The "my" was dropped out of worries that recent arrivals from other nations might be seen as pledging their loyalty to the flag of the country of their birth. The most significant change in the wording came in 1954, when -- with the enthusiastic support of President Dwight D. Eisenhower -- the phrase "under God" was added just after "one nation." Eisenhower declared: "In this way we are reaffirming the transcendence of religious faith in America's heritage and future; in this way we shall constantly strengthen those spiritual weapons which forever will be our country's most powerful resource in peace and war." The wording of the Pledge of Allegiance may or may not be changed again in centuries to come, but it's a pretty safe bet that the Bellamy Salute is never coming back. Once ubiquitous and unquestioned, it has become a faded and mostly forgotten bit of U.S. history.